DENMARK: Manufacturer MHI Vestas has started construction of an assembly facility at the Port of Esbjerg, west Denmark, adding 65 jobs to the site. The joint venture said the new 5,600 square metre site would house manufacturing for its power converter modules (PCM) for the V164 offshore wind turbine. It is the second time this year MHI Vestas announced an increase in manufacturing capacity. In March, the firm said it was adding 414 jobs at its Lindo and Nakskov blade and nacelle plants in order to meet demand. "The next phase of our production plan calls for a hiring ramp up for blade manufacturing in Nakskov, nacelle production in Lindo, and PCMs at the Port of Esbjerg. PCM modules will be assembled in Esbjerg from Q4 2017," said MHI Vestas chief manufacturing officer Robert Borin. In January, MHI Vestas completed an upgrade on its V164 turbine to increase output of 9MW, breaking the 24-hour generation record in the process. 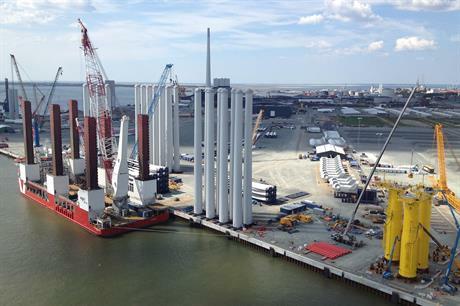 The V164 machine was named the preferred turbine at the Borssele III & IV site in the Netherlands in March. Its pipeline also includes the 252MW Deutsche Bucht project in Germany, the 370MW Norther development in Belgium and the 92.4MW European Offshore Wind Development Centre project off Scotland.